I raced today in Williamsport, PA (about 3 hours from Rochester.) We left early this morning and made the gorgeous drive South. What a perfect day for canoeing!! I raced c2 with Dylan, and Marc and Holly also raced mixed c2. Marc and Holly walked away from the car for a bit to put drinks in the boat and Dylan poked his head around the other side of the van. "Wait a second... What's wrong? Who are we racing?" "WHAT!?!? Nobody told me that!!" When I finally stopped giggling, he smartened up and corrected himself. "Okay fine... so... are you ready to come in second!?" I just looked at him and burst out laughing again and pointed to the Rankinens (Only one of the top men's pro teams in the country.) His face fell and he gave up on trying to get me fired up. Another highlight of the day was when Dylan didn't know that the race was 12 miles instead of 9 miles. Not to rip on him too much, though. It was good for some laughs in the boat and luckily by that time we had secured a solid 3rd place for ourselves (behind Marc/Holly and Steve/Jeff) and so the subsequent carnage during the "un-anticipated" last 3 miles was of little consequence. We had a great time, finished respectably, and look great in our new suntans. 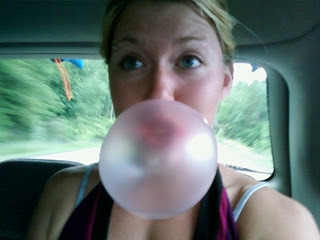 On the car ride home, Holly, Adrienne, and I chewed mouthfuls of bubble gum, which- yes- is about as gross as it sounds. However, it's a good way to pass the time and try to drown out the sound of classic rock on the radio with incessant gum-smacking. I used to chew bubble gum in my c1 to keep from getting bored in practice because I was so far behind everyone else. Maybe I will bring that back. Happy 15th birthday to my brother!